When we think of libraries, sights of neatly stacked books for various age-groups encompassing a variety of genre, in an airy room tucked away in our friendly neighbourhood fills our mind. A great concept that allows for sharing and reading endless books without having to spend a fortune, yet satiating the desire to devour the girth of knowledge and experiencing the joys of reading. Now, by extending this thought, think of the possibilities when you replace books with toys. Interesting, isn't it? A toy library is not a foreign concept. It is perhaps a lesser known concept that has not been fully exploited. I first came across this concept when I went to Mumbai last year. My sister is a member of a toy library and it was through her that I got introduced to this interesting idea. It works in the same fashion as a book library would. A deposit fee and a rental fee is all you need to get a membership and lo! a plethora of good quality activity toys that caters to a wide age group of kids is available to explore. Pick a toy that fancies your kid's interest, let the child play with it till he or she fully exploits the interest, concept and fun behind it and once the child seems to lose interest, return the toy in exchange for yet another new one. No heart-burns over an expensive but short-lived toy and no worries of storing similar kinds of toys too. The benefits could be many; this being a small step towards a more green and eco-friendly environment too. Come to think of it, kids today are spoilt for choice with the eye-catching and extremely good variety of branded and even non-branded toys that are available in the market. While toys form a great educational tool in the formative years, what is the shelf life of any given toy? 6 months-1 year, sometimes even less or more. It highly depends on the nature of the toy and the kid's aptitude and disposition towards toys, isn't it? Doting parents may not think twice before showering in the best of best on the apple of their eyes but when you look at it objectively, there is an angle of too-much-too-soon. Children do not understand the value of money unless it is taught by example. With the number of kids fast reducing to one per family, the concept of sharing is also quite difficult to inculcate. However, when a toy comes with a pre-limit on the time that can be spent with it, the benefits to be derived from it can be maximised; a simple demand-supply theory, here too. The child can be taught the importance of handling a toy correctly and carefully in addition to putting a cap on the attachment value to a particular toy. Of course, while this need not be a rule for every single toy that comes into the house, a toy library can largely widen a child's horizon by exposing him to as many toys as possible yet at the same time not run the risk of spoiling the child's behaviour. And, what better, when these libraries are available online too? Just select the toy and have it delivered to your doorstep! While, there may be quite a few toy libraries in Bangalore, I'm not sure how popular they are because I have not heard of these being advertised or discussed around where I stay. Hence, when Anupma, founder of LearningLadders.in, contacted me with the details of her online venture, I thought I could contribute in just spreading awareness about this concept. 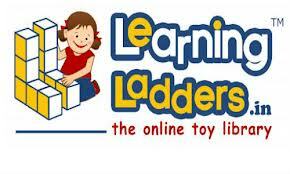 Learningladders.in an online toy library, Bangalore, which offers an exclusive range of Branded, Educational toys on rent for kids (0 - 8 years of age). Since, I'm not a member of this online library, I cannot describe my personal experience. However, the concept is not something alien to me and I do subscribe to the idea behind it. The website and features seem promising, so I might just go ahead and give it a try. ETA: Most of us have concerns over the hygiene quotient and as one of you correctly pointed out, the toys are cleaned, sanitised and shrink wrapped before it is handed over for the next circulation. I am not in india so cant be a member.. but how good is this hygenically..
the lady in charge did mention about maintaining good hygiene levels, though. have not heard here. thats the first thing they will say hygenie.. Thanks for the reference...will be sueful a few months from now...:)) I love toy libraries too! Btw i have seen each of the toys when they are returned are sanitized by the "librarian" - this is in response to the first comment. I guess all the good libs would be following this practice. you are right Aparna, about the hygiene thing. The website also mentions about the toys being sanitised and shrink wrapped before the next circulation. This is the first time I have ever heard about this concept. It is very simple and effective. As you pointed out, cost-effectiveness is easily achieved :) Also, when the kid gets to comprehend the concept of toy-library, the concept of sharing goes in too. True, Keirthana. Once the concept is understood and accepted widely, it can definitely have greater benefits. i personally give a thumbs up to this idea. toys are available in libraries here and just the other day, i was wondering hy wasn't this option explored in India. now that you tell me about it, I am super glad! These kids toys that usually come with "developmental" labels are super expensive and burn your pockets... and we the neo parents do not want to deprive our child of any early stage development. this toy library comes to the rescue! very aptly said, toys have a very limited shelf life... you buy something because for that moment it caught your kid's fancy and by the time you reach home, the toy is already obsolete! and if not, they'll bang it on the floor and 1000 rupees in drain! when it comes to someone else's property, parents will also pull up their pants and start teaching the kid the importance of not spoiling it. I'd perhaps like a real library not an online one. Like you said abt shopping online, i like to get the real feel of things, hold it in every direction, compare it with another, put it down,take it again.. hehehe...and since it is a toy library, I'd prefer asking my tot for her opinion which one she prefers. The idea is catching up here though not widely prevalent. True that you may want to touch and feel the toys before selecting but I guess most branded toys look as they appear on screen, so maybe there is less chance of being disappointed.. Sounds like an interesting and innovative concept ! My friend is a member of the toy library. but somehow, I have never become a member, dont ask me...I think its a wonderful idea though as long as hygiene is maintained! Good ones do maintain the hygiene levels, RM.. Anything to do with small children needs to be hygienic as well as safe as Bikram rightly mentioned. The idea is otherwise a good one, Uma! Its a good idea but very small children would not know how to handle the toys and hence they are prone to damage rt? Yeah, that is a valid concern. Probably in such cases extra parental supervision will be required and who knows the concept of handling well can be incorporated early on?? Uma, this post made me nostalgic. During my UG, we pitched for a business plan competition with this idea. It was called Kreeda Corner and our team won the show :) So yes, this is a great idea. The key drawback we had was to show damage/broken toys in our balance sheet :) We did talk about how parents will take care, the deposit will cover 70% of the toy costs etc :) Surprisingly, no one pointed on the hygiene bit then! wow..congrats on that win!! :-) hmm..maybe because, hygiene is fast becoming a concern as parents are becoming more aware about the environment and the general health of their children? Sounds like a good concept. I've heard about another such library in my area. Oh, really? over where I stay, I don't think there are any.. The concept is good. I wish I could find something on similar lines here in pune. there might be, Jas..you can probably do a search..
How fun? I haven't heard of this concept before. Very good idea..parents don't have to buy a lot of toys..I should try in our area.. Yes, do try, Latha..there might be one in your neighbourhood..
they do maintain good standards of hygiene, Gopinath. I've heard about this concept too but never thought of these many dimensions to it :) They are all so true .. Well thought out I must say ..
And going by high standards of services provided by most online ventures these days, I guess the hygiene aspect would certainly be taken care of ..
Really informative article ..Keep posting more article..